SOGS recognizes that food insecurity is an increasing challenge faced by graduate students at Western. 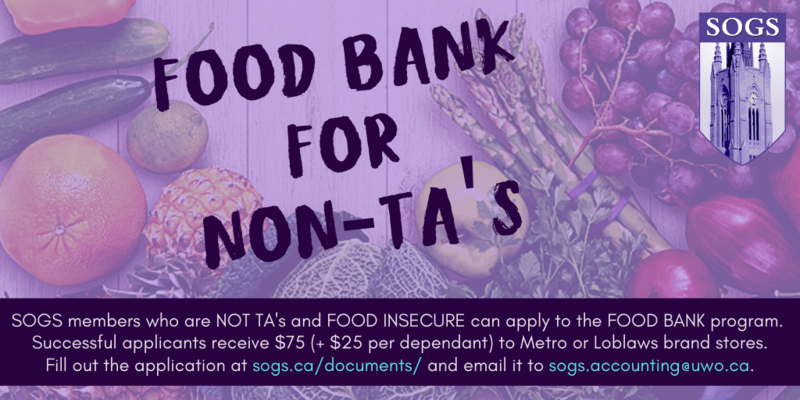 As part of SOGS’ commitment to health and wellness initiatives on campus, the SOGS food bank program for non-TA members aims to reduce the impact financial shortfalls have on a student’s ability to access healthful and nutritious food options for themselves and their families. Please also see here for additional information on food support resources and services. The SOGS food bank provides grocery store gift cards of $75 per applicant (plus $25 for each dependant) that can be used at Loblaws and Metro brand grocery stores. We believe this approach respects the autonomy of our members to make informed choices about their nutritional well-being and provides members with greater access to grocery items that best support their circumstances and/or any dietary needs that a regular food bank may not be able to provide assistance for. The SOGS Food Bank for Non-TA Members provides assistance to members who are experiencing extreme financial difficulty which significantly affects their budget for food. The SOGS Food Bank Program has been developed to complement the Food Support and Resources Fund of PSAC Local 610 which is available to our TA members. This is a limited resource. It should not be used for chronic need. The Society may not be able to approve all applications. Members experiencing financial difficulty should also consider applying for a SOGS Emergency Loan. Complete the Food Bank for Non-TA Members Application Form. This form can be downloaded or collected from the SOGS Office. You will be contacted via email to confirm if your application has been approved. Our goal is to contact applicants within two business days. Please note: You may also be contacted with questions regarding your application if information is ambiguous or missing. Bring your student ID with you to the SOGS Office during business hours. check your student ID to confirm you collect the correct allotment of gift cards. ask you to identify if you have a preferred grocery store based on the gift cards we have available.